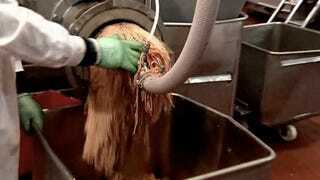 If you're curious about large-scale meat-processing machinery and sanitation procedures, definitely watch this video. If you ever, ever want to eat fast food again, maybe don't. Made to reassure the public about the safety and quality of McDonald's meat, this tour of one of their meat providers' factories is interesting, partly because of the complex, bewildering preparations that the beef patties go through and the amazing machines that do the work, but mostly because of how much the procedure resembles that child-grinding scene from The Wall. The video has it all: masked employees earnestly voicing the virtues their "USDA-inspected" product while behind them, a torrent of beef spews out of a giant mechanical meat-hole onto a speeding conveyor belt; tubs, pipes and boxes of various sizes and shapes carrying a roiling mass of beef slurry; countless, mysterious processing chambers, each of which does who knows what else to the patties. The final step of the process: after all the processing, grinding, forming and freezing, the last device the patties pass through before packaging is a metal detector. In other words, go to McDonald's, because your Big Mac is practically guaranteed not to have a lug nut in it.